While a picture is worth a thousand words, capturing moments on video really allows you to relive the experience all over again. In this unit, we will develop the skills to become better at using a camera and editing video clips. We will also be learning useful information about video characteristics and distribution methods. This type of knowledge and skill can be useful in many different fields of study including communications, marketing, television production, and others. Whether you're an aspiring Hollywood director or just an amateur videographer, this unit will be useful and interesting. The software we will be learning to create video productions is Adobe Premiere Pro. It is a non-linear, timeline based program that is highly powerful, yet rather easy to use. It works seamlessly with other Adobe programs, like Photoshop and After Effects (a video animation creator). We will be practicing some very useful tools and features that will help you create amazing video productions. However, we will only be learning a small representation of what this software is fully capable of doing. This software is very powerful, which results in it being rather difficult to navigate at times. To learn the basic tools and features of Adobe Premiere, we will begin by manipulating still images and adding motion, opacity, and other animation effects. As the class becomes more proficient, moving video will be captured and edited to produce creative, professional artifacts that demonstrate the students' knowledge and skill in video production. Inside the SKILLS page, you will find project descriptions and constraints, the files necessary to complete each project, and how you will be submitting your finished video compilations. The content about video production is diverse and can seem very technical at times, but it is very necessary to operate in a professional setting. Things happen very quickly on set of a production, so it's important to understand technical terms and how they are applied in a real-world workplace. We will learn a lot during this unit - including camera techniques, shot composition, equipment and cable types, and common video file types and their characteristics. 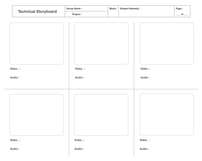 Using a storyboard in the technical preparation phase is absolutely necessary if you intend to create effective, interest-grabbing video productions. Use the template on the right to plan out shot composition and/or camera techniques, spoken dialogue or background audio, and how the overall progression of your video will take place from start to finish. Sketch out the visuals and describe the technical details in written form. If this preparation phase is used appropriately, it will help eliminate mistakes that can result in an ineffective video. Want to grab that video off of YouTube to incorporate into your latest video production? Copy the YouTube URL for the video you want and paste it into the field on KeepVid. It is OK to use these videos since we will not be using our productions for commercial purposes, but be aware that this process violates copyright and trademark policies. As you will notice as you learn and work in the Adobe Premiere Pro software, it has a lot of features that we will not explore and use in our projects. It is a very powerful program that is capable of producing high quality, professional looking video productions. Using the tutorial websites on the right, feel free to further explore Premiere and all of its tools and features. These websites have both written and video tutorials that will walk you through everything about the software - everything from basic setup to creating stunning special effects. Follow the directions and it will result in awesome videos that will capture the audience and leave a lasting memory. Adobe Premiere is a powerful, yet easy to use software. However, it is a rather expensive product. Fortunately, there are several free, downloadable video editing softwares available. Apple iMovie comes pre-installed on all Mac computers, and is a great editing program. It's counterpart, Windows Movie Maker, comes pre-installed on all PC computers. Click through the links on the left to find more free programs that are great for cutting, splicing, and assembling video clips. I have never used any of these programs extensively, so use the help features on each website to find out how to use each software.